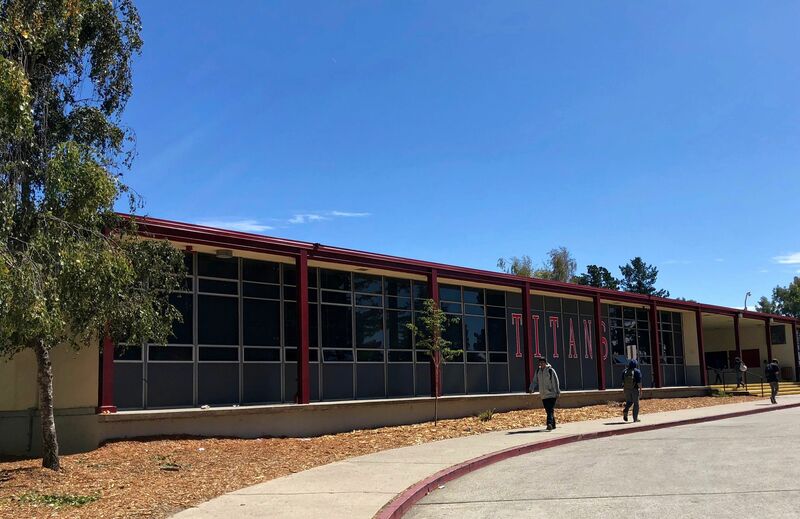 Standing in front of her former teachers at Skyline High School in Oakland, California, this September, alum Keylah Cage had come full circle. There to present on behalf of the Roots Community Health Clinic, a local nonprofit dedicated to health-care access, Cage outlined how the clinic might provide tutoring and counseling services to at-risk Skyline students. Just five years ago, Cage completed Skyline’s Education and Community Health career pathway program, and went on to major in public health and health education at San Francisco State University. She was hired weeks before she graduated. At another high school, Cage might not have found her calling or the support required to pursue it. During her four years at Skyline, she completed a paid summer internship at a nonprofit that offers counseling and training to incarcerated youth, and conducted research on the benefits of preventative health care. While her story is a particularly tidy advertisement for the advantages of a well-constructed career and technical program, its plot turns are not atypical. While popular in the 1960s and ’70s, vocationally based career and technical education (CTE) programs started a slow decline in schools by the ’80s, as reform movements inspired by A Nation at Risk—the landmark 1983 report that called out U.S. schools for poor performance—pushed for more students to take courses preparing them for college and white collar jobs. By 1998, only 8 percent of students concentrated in vocational training, down from nearly one-third of high school students in 1982. But in recent years, school systems have revived and modernized their programs, as a growing body of data shows that many jobs will disappear or require new skills in the next few decades. According to a 2017 Brookings Institution report, in 2015 alone 39 states created 125 new laws, policies, or regulations concerning CTE, some of which involved the allocation of state funding. In response to the perceived need, school districts have developed comprehensive career training programs or academies, and built partnerships with community organizations and businesses to provide students with work-aligned experiences outside school. School leaders believe these programs will not only help students develop necessary skills for today’s job market but encourage students to see themselves in professions before they graduate. 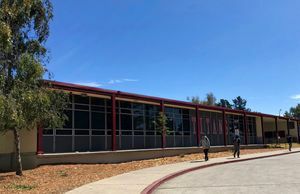 Sprawled across 65 sun-drenched acres, Skyline High School is an anomaly in the relatively affluent and white neighborhood where it resides. Over the last few years, the school has rapidly diversified thanks to the district’s open enrollment policy, and today 31 percent of its 1,800 students are black, 40 percent are Latino, and 14 percent are Asian. More than 75 percent of the student body qualifies for free or reduced price lunch. Walking around campus, one sees the typical, messy energy of a large public high school. Some kids bounce raucously through the hallways, slide into class after the bell, and tap away at ever-present phones. And like many urban schools, Skyline has faced its share of challenges retaining teachers and administrators. Twenty-five years ago, Skyline launched its first career and technical education program, then called the Education Academy, with support from a grant. Following trends of CTE programs nationally, the program shifted and evolved over the years in an effort to serve the increasingly diverse student body—and give every student a chance for success after high school. A Skyline teacher shows students how to create a clay model of the endocrine system for the Community Health and Education Pathway. 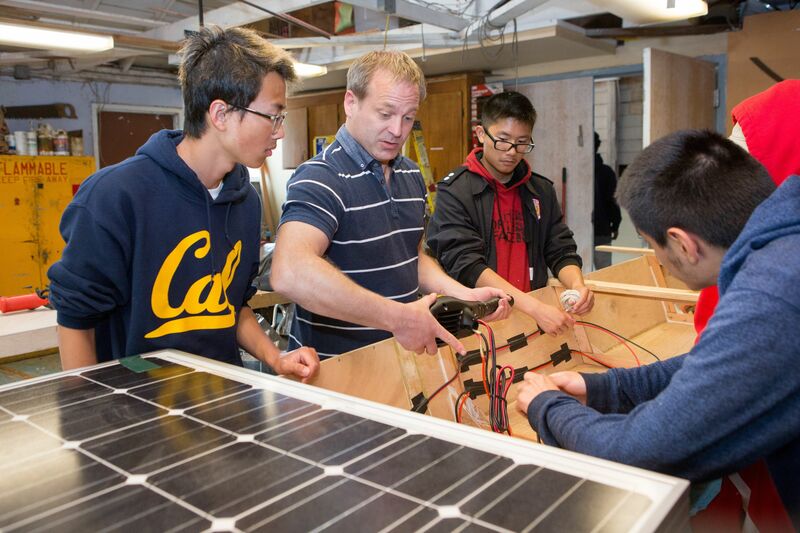 Today, the school uses Linked Learning—a curriculum that emphasizes rigorous academics paired with work-based learning experiences—and mandates that every student in the school to enroll in one of four academies: Computer Science and Technology, Green Energy, Community Health and Education, or Visual and Performing Arts. In addition to required core academic classes, students explore careers within their industry theme and receive college credit for passing courses taught by community college instructors. The goal is to provide students with meaningful, cross-disciplinary academic opportunities that connect to real careers, according to Justin Anderson, an assistant principal at Skyline and an administrator in the Computer Science and Technology Pathway. Computer Science and Technology seniors create documentary films on issues affecting their communities, such as gang violence, drug abuse, and homelessness, for example, and share them at a film festival at a local theater. “The students are so proud—they can really hang their hats on it,” said Anderson. 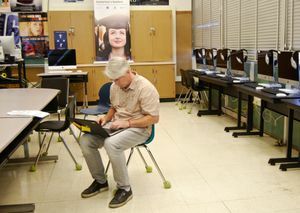 But not all CTE programs—even the new ones—are useful, according to Dr. Robert Curtis, director of regional and district partnerships for ConnectEd, an organization that helps schools and districts design and implement pathways programs. Curtis says that the cursory alternatives many schools have adopted don’t do enough for students. Others have questioned whether it’s even advisable to track students that age into a particular field of study, arguing that young people need more freedom to explore a broad range of possibilities. Another worry has been that pathways can be used as a form of segregation, where students end up grouped along racial and socioeconomic lines. Students in the Green Energy Pathway at Skyline study solar energy. To address some of these concerns, Skyline consciously tries to diversify the ethnic and gender composition of its academies. Within each pathway, students consider different jobs and what each might entail in terms of training and education—from an associate’s degree to a PhD— along with what they can expect from a particular career path. An out-of-school internship with a local company or organization is required for all rising seniors. Students in the Green Energy track, for example, have worked with the Environmental Control Technology program at a local community college. They wrote policy papers and pitched sustainable designs for their local sites to Oakland city planners, the local transit line, and other entities. In 2017, after their presentations, some students were offered internships on the spot. “Our teachers encouraged us to [focus on what] we were passionate about, so it could really connect to our lives,” said Sylvia, a senior. Similar to majors in a large university, the pathways program can help carve a large school like Skyline into manageable parts that encourage bonds between students and faculty—and make interventions more targeted and more likely to lead to student improvement. 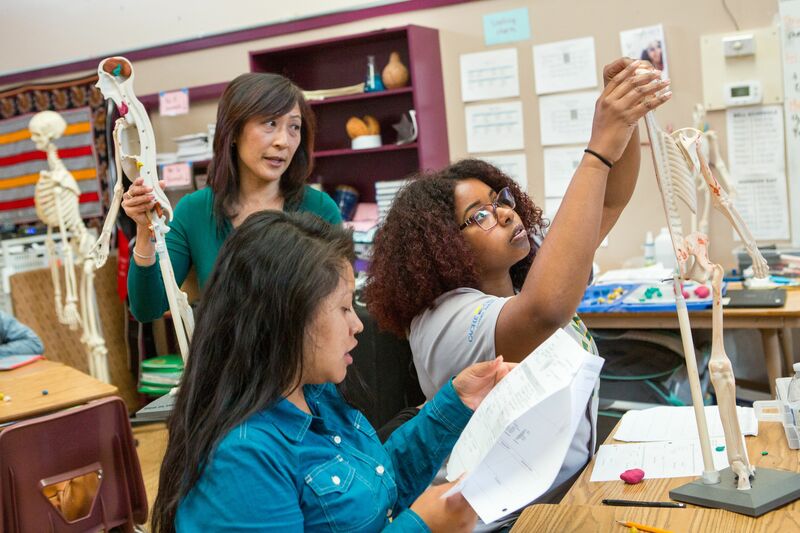 Skyline’s bell schedule permits each group of teachers in a pathway academy to collaborate for three class periods a week: once for hammering out program logistics, once to plan curricula, and once to discuss students needing academic and personal support. A Skyline teacher in the Computer Science Pathway examines a list of students needing extra support. On a recent afternoon, teachers in the Computer Science and Technology Pathway went over a plan for identifying students needing intervention. Staring at a spreadsheet, the teachers noted students whose grades and attendance were slipping and might benefit from more mentorship. They then assigned numbers to students depending on the severity: A student in Tier 2 might require a weekly check-in, while a Tier 3 student, or so-called “hot one,” might be at risk of dropping out. “We’re able to really keep track of these students in a smaller learning community,” explained Meghan Johnston, a teacher in the Green Energy Pathway. But does that support translate to college graduation and a career? According to Skyline College and Career Pathway coach Anya Gurholt, while the district doesn’t have the data to show that yet, the support structures and relevant academic focus of pathways programs may eventually lead to an improvement in the school’s graduation rate: In 2012, before pathways participation was mandatory, the graduation rate was nearly 30 percent higher for students enrolled in a pathways program. Skyline’s pathways programs may put students in a better position to realistically consider and pursue possibilities for their futures. In the case of Skyline senior Patty, the Education and Community Health Pathway has made her consider a concrete role she could play for her community. “I’ve never had a black therapist who could relate to anything that I’ve actually been through. If [kids] talk to somebody who can relate to them or comes from where they come from, then they’re more likely to listen,” she said. And for Antwan, a senior interested in majoring in English or politics at a university in New York City, that same pathway has helped him develop skills—community outreach and public speaking—that could benefit him in most careers. It’s also shifted his views on public health challenges close to home.